Anders Linneman Hjarnaahas has worked in the web industry for 17 years and runs his own web agency, CPH Cloud, in Copenhagen, Denmark. With a solid background in ASP and ActionScript, Anders quickly picked up Corona SDK and began working on his first mobile game, CodeCrusher. 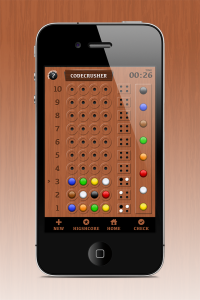 In today’s guest post, Anders writes on how he recreated the classic “Mastermind” board game for mobile devices with the launch of CodeCrusher. A week before Apple released iOS 7 and moved away from the “skeumorphism” of previous versions, I decided to update my previously-released game inspired by the classic board game Mastermind. I stripped all of the “wood and velvet” out of the app and styled the game with a new, sleek design inspired by Jonathan Ives’ iOS 7 design. Little did I know that my updated title – CodeCrusher for iOS 7 – would soon top the charts in App Stores around the world, selling more than a 1,000 copies a day. It all began last summer when I vacationed in Malta with my girlfriend and some friends. Line, my close friend for many years, brought an old board game from the 1970s called “Mastermind.” I had completely forgotten about this classic game and was a bit unfamiliar with the rules and gameplay. During the week in Malta, we played a lot of Mastermind and I developed my own technique that proved rather effective. One evening when I was waiting for my turn to play, I had the idea to make this classic board game into a mobile app. I went online and bought Corona SDK Mobile Game Development – Beginner’s Guide to learn the basics of the platform. At the end of the vacation, I had read much of the book and I had a working prototype based on a highly modified version of the sample game from the book. 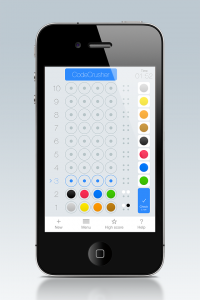 This hooked me on the idea of creating a nice, mobile version of Mastermind. I searched the App Store and found quite a few versions inspired by the classic game, but none had the same feel as the original. I decided there was room for improvement. Back in Copenhagen, I didn’t have much spare time to work on the game. I was busy running my web agency. I only found a couple of hours after work or on the weekend to spend on the project so it took me close to a year to finish my first version of the game. I released the title as a free game on the App Store, close to a year after my vacation in Malta. I spent about one hundred hours working on the game, which included a lot of trial and error. I used Game Center for achievements and high scores. I built my own backend server to keep a local high score and keep track of new users. I integrated Flurry to have more analytics in the game, along with Facebook and Twitter to allow users to share their scores. Design-wise, my game was a solid remake of the original game from the seventies, very similar to the wooden game board with nearly identical gameplay. Initially, the game received many downloads with about 2,000 on the day of launch. After a month, it was still being downloaded around 500 times a day, and three months later it had reached near the 50,000 download mark. A month ago, I decided to create a remake of the game with the new and sleek iOS 7 design. I wanted to test how many downloads I could get if I priced the game at $0.99 instead of offering it for free. Our designer Mark quickly made a complete redesign for the new iOS 7 flat design. This took him roughly two days, and I spend only three days implementing the new design along with some gameplay improvements. The redesigned version of the game, now called CodeCrusher for iOS 7, has enjoyed many downloads from the start even though we chose a premium monetization model. Apple only uses the app name and keywords in App Store searches and does not search your app description text. So, no matter how much text you have in the app description, it will not help you in searches. To work around this, I took great care when choosing the right keywords. I wanted to be ranked high in search results if users searched for “iOS 7” or “iOS7,” and because of these keywords, my game is now the ninth search result if you search for “iOS 7.” I strongly believe that this is one of the reasons my game quickly topped the charts around the world. Since relaunch, the game has soared to #1 in the “Board Games” category in Canada, it was a Top 10 in the U.S., and was the most purchased game in Denmark, Belgium, and Holland, surpassing even mega-popular titles like Angry Birds, Grand Theft Auto 3, Plants vs. Zombies, and FIFA 13 by EA SPORTS. At the moment I’m selling over a thousand copies a day — all of this thanks to a nice vacation in Malta with a classic board game and the ease of development using Corona SDK. Are there any copyright issues in copying old board games ? There are quite a few I would love to make but worried about copyright. Or is it if you don’t use the name your fine but you can copy the basic idea ? We checked with our lawyer, that specializes in Intellectual Property rights, and for sure you cannot make a complete remake of an existing game. However it’s not possible to have rights on the exact gameplay and algorithm. You can have the right to board design and naturally the name. So you cannot reuse existing names or copy board game design. Also you can’t be close to the name, like MindMaster or something similar. I our case we choose a different name, and a distinct one, that no one else uses, so we will have the rights by using it, or we could go ahead and pay to get the rights for it. Naturally I will always advice you to check with your own lawyers before doing too much work on a game idea, that turns out to be in conflict with IP rights. We got an email with claims from Hasbro once, so be aware. The more an app has the original feel, chances for a similar claim get more and more probable. Redesign with iOS7 looks is a step in the right direction. Seriously, over 1000 a day???? I just did the math here, and that’s amazing. Keep it up and you might retire early. Impressive – and congratulations! We have a lot of new ideas in the pipeline, including multiplayer functionality, that will also further promote the game. Excellent, congrats! It is really cool to see one of Corona fellow developer have success with their app. I am also 100% agree with you about the importance of ASO. I can see why ios 7 is there but why use CodeCrusher? I will think you will want Code Crusher? That way you can rank for Code and Crusher keywords and many combinations of those. In any event, your app looks very cool and I hope you continues good luck with it and thank you so much for sharing your results. Thanks, we choose the name CodeCrusher, to have a distinct name, that no one else uses. In the key words, we do optimize for both Code and Crusher, so we will rank in those search results. Good luck with your app, let me know if I can share any of our knowledge with you, to help you succeed. I also curious that is there any copyright issues in this kind of recreating projects. Thanks for your response and offer, I appreciate that! I will contact you if I have a very specific question but in the meantime congrats again for a great success. Like I said, it is nice to see and very encouraging for all of us! We use it for both gaming and apps for our students here in Odense. It is brilliant and so easy to use. Feel free to contact us if you need further network. Hi Michael Great to hear from a fellow Danish developer. 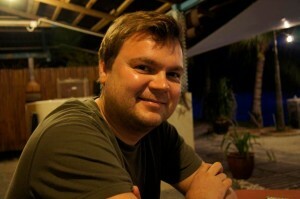 I’ll get in contact with you ASAP, it could be nice with some Corona networking in Denmark.